MK Dr. Michael Ben-Ari offered an uncompromising appraisal of Sharon's life, saying that "history judges the results." "When Ariel Sharon stands before the heavenly court and good and bad angels empty the cases on the scales of judgement, there will be great tension," wrote Ben-Ari on his official Facebook page. "The scales will waver wildly from here to there," as initially his military accomplishments in defending the country will tip the scales in his favor, opines Ben-Ari. "But then will surely come the 26 destroyed communities in Yamit, flowering greenhouses, vibrant communities, and they will tip the scales against him," writes Ben-Ari. "Expelled residents of Yamit who grew old and wrinkled with the memory of their destroyed efforts, refugees of Gush Katif in Nitzan and Nitzana, waiting for the fulfillment of the promise of 'a solution to every resident,'" he said, alluding to the plight of the refugees of Gush Katif, many of whom remain without permanent housing or employment more than eight years on, despite government promises at the time. "All these will come and shed their tears and affronts on the scales against him, and again the scales will waver, this time to the left," according to Ben-Ari. In Ben-Ari's analysis, there is "Sharon the man and Sharon the phenomenon," namely a seemingly right-wing leader who doggedly defends Israel's security but in the end brings tragedy and disaster to Israel by turning left politically. Ben-Ari continued by saying he was issuing his criticism "because I must, because the danger is crouching at our door, for there are many others in the 'right-wing' figure of Sharon. Declared right-wingers to all appearances, who suddenly flip on us." 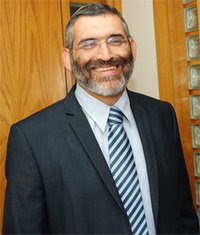 In particular, Ben-Ari pointed the finger at Prime Minister Binyamin Netanyahu, former Prime Ministers Ehud Olmert and Menachem Begin, Justice Minister Tzipi Livni, and Defense Minister Moshe Ya'alon for following the same path of initially pushing for Israeli security only to change suddenly in making concessions. "When the right-wing ideology is security-based, that's its end," warns Ben-Ari. "Our hold on the land of Israel isn't a matter of security, but rather faith. Rabbi Meir Kahane (Hy''d) said of this: 'I don't want to lose my land, not in war and not in peace.'" "Sharon, who was a hero in war, brought on us destruction and dangers in the hallucination of peace," concludes Ben-Ari. "A pity over his old age that shamed his great acts."